Open the menu for editing a data room to move the room. This is done eiter by right-clicking on a room within the room-list or, alternatively, by clicking on the settings icon inside the room. Then move the cursor over "Move to Organization". That will display all available organizations. 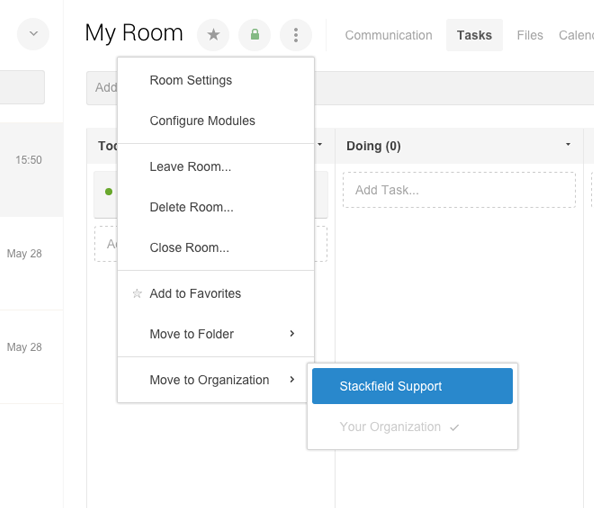 Click on the desired organization in order to move the room. Rooms can only be moved between organizations outside the trial period. The users included in a data room will be added as guests to the organization if they are not already a part of it. When the limit for guests in an organization is reached, the user will be added as deactivated guest.